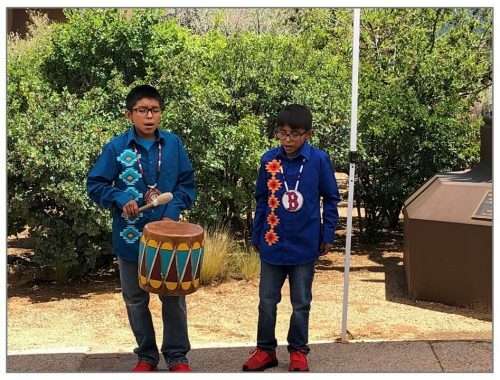 On July 23, 24 & 25 the New Mexico State Library Tribal Library Program partnered with the Museum of Indian Arts and Culture (MIAC) in Santa Fe to bring the national summer reading theme of Libraries Rock to tribal libraries in the state. This is the 4th year of the program. This year the theme was music and we were helped out by 3 young men who each brought a different component of music to life for the kids. 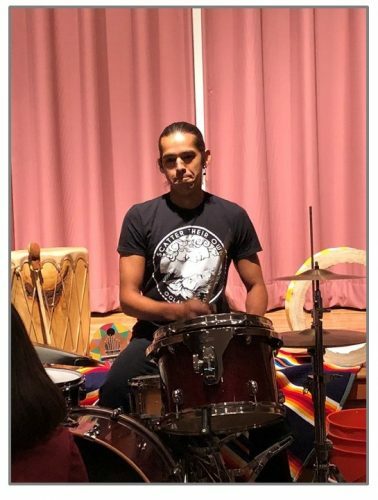 Ehren Kee Natay introduced drumming and rhythm by sharing different kinds of instruments from around the world and even traditional drums from the MIAC collection. He brought his own drum kit and played requested styles of music (rock, hip-hop, blues, jazz, etc.) and even let the kids practice some beats of their own. The kids created original pieces of art with Dylan Tenorio while listening to a variety of songs and then drawing what the music made them feel or see or even taste. This is called synesthesia. Then Santi Romero taught dance/movement using a mixture of traditional and current dance moves. 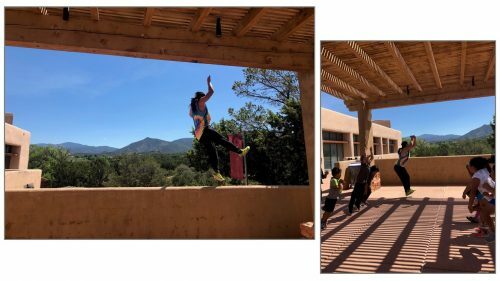 There was a guided tour of the Here, Now and Always exhibit in the museum and lunch was provided by Chastity Sandoval who cooked a pre-coloninzation meal- consisted of foods that would have been available before the Spanish settled New Mexico: turkey, corn, beans, deer, wild onions and squash. She cheated a bit by providing grapes and a variety of berries for dessert. The libraries that participated were invited to take part in a cultural exchange and perform for their fellow libraries. Santa Clara performed a puppet show of a Pete the Cat book, Tesuque and Okhay Owingeh danced and Jemez provided drummers.